Last Saturday, I told Ate about Ayala Malls' Lure Party, and since she's super into Pokemon-Go, she drove me to Alabang Town Center. I also thought that it's a nice time to catch-up and level-up! When we got there, Pokestop kaagad nakita namin! I think I caught so much Pokemon in this area that I did not want to walk na! Haha! Ate told me that we search for the Lure area, so we walked further. Then I saw what a LURE PARTY is all about! Waaaah! Thank you Ayala Malls, haha! These are not ordinary shoppers on a Saturday! ATC's Corte De Las Palmas was filled with Pokemon Trainers! Ayun nakita siguro ni Tatay si Zubat! Haha! I enjoy this type of Pokemon events because it's not dyahe to raise your phone to catch a Pokemon! Ang saya! You'll also get tips from random people, and then hear someone shout, "Uy may **!!!" Caught all sorts of Pokemon I haven't seen since I started playing! Panay Rattata and Pidgey lang kasi ang nasa bahay, haha! The Beedrill near Mary Grace and Starbucks gave me a hard time, 10x ata nakatakas to hoho! Another Pokestop! What I love Ayala Malls' Lure Party? They also played the Pokemon songs to set the vibe, making it even more exciting to play! Nakaka-dala! Haha! I want to be the very best! Hehehe! After an hour, we took a Serenitea break near ATC's cinemas, and passed by Brooklyn's new, cute Pokeball Pizza offering! Walked back to Corte De Las Palmas for the last few minutes of the Lure Party! 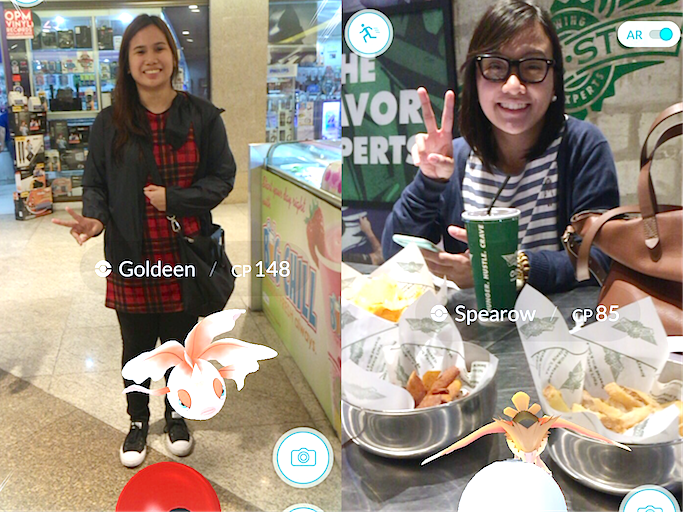 Ate told me to catch them all lang talaga, haha! That's regardless of CP or type of Pokemon - so I did just what she told me. You teach me and I'll teach you, Pokemooon! Haha! Went to Wingstop for dinner, and still caught a few Pokemon while waiting for our food! Don't worry Spearow, garlic parmesan fries and sweet potato chips lang inorder ko, hehe! Overall, it was a fun bonding experience for me and my Ate! Most of the people playing with us were also families or barkadas. I was a bit clueless about the game, but Ate taught me the basics and we were playing the whole afternoon na! We were also able to eat out and shop in between. I bought new materials for my art journal in my favorite ATC Fully Booked, while Ate finally tried Wingstop's new flavors. PS: Caught a Psyduck on our way back to our car, hehehe. Cute! Hope there will be more Lure Parties in ATC, please! For updates, follow Ayala Malls on Twitter (@ayalamalls), Instagram (@iloveayalamall), and the hashtags #PokemonGoAyalamalls #FindEmAtAyalamalls.